In 1997, Curtis Hansen turned James Ellroy’s L.A. Confidential into the best L.A.-based noir since Roman Polanski’s Chinatown, and perhaps the best movie of the 1990’s. Kevin Spacey, James Cromwell, and Kim Basinger turned in some the best performances of their careers; Russell Crowe and (to a lesser extent) Guy Pearce announced their arrival as major talents; and even role players like Danny DeVito used their skills to further a wonderful, and wonderfully complex, storyline. Brian DePalma, who hasn’t had a hit since ’96’s Mission: Impossible, has spent his entire career in the shadows of Martin Scorsese and Stephen Spielberg — Speilberg’s Jaws came out in ’75; DePalma’s Carrie and Scorsese’s Taxi Driver in ’76, and it’s been downhill for DePalma almost ever since. He likely thought he could do as well as Hansen with Ellroy’s The Black Dahlia — starring Scarlet Johansson, Josh Hartnett, Aaron Eckhart, Mia Kirshner, and Hillary Swank — which was released yesterday. Boy, was he wrong. DePalma’s Dahlia almost completely eviscerates the tortured struggles and soul-killing obsessions that fuel Ellroy’s novel. All of the novel’s nuance and complexity has been chopped out of the script, ineptly adapted by War of the Worlds screenwriter Josh Friedman (but beautifully rendered by cinematographer Vilmos Zsigmond). Johansson and Hartnett are actors capable of disaffected inscrutability; they’re not so good at portraying the evolution of people slowly hardened by a rising tide of senseless destruction. Eckhart, perfectly enjoyable in comedic roles, looks silly trying to play a Benzedrine-addled, coldly calculating cop. 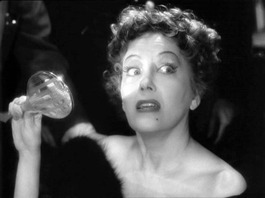 The film’s depiction of the Dahlia’s murder, which features Fiona Shaw channeling Gloria Swanson channeling Norma Desmond, is pure camp. Most crucially, De Palma’s movie alters the book’s ambiguous denouement, opting for cinematic neatness rather than a more open-ended, and more challenging, conclusion. In Ellroy’s Dahlia, the book’s narrator ends up entering into a conspiracy with his lover, who also happens to be Short’s killer and doppelganger. In De Palma’s screen version, he blows her away at point blank range. I’ve been looking forward to De Palma’s Dahlia for over six months; with the absence of Teamocil in my life, I need to find some pop culture distractions besides the stilted Pam and Jim love affair. Alas; it looks like it’s back to Behind the Music for me. Seth, did your perhaps remember one bit of Ellroy’s “Dahlia” incorrectly? You say that Bleichert “enters into a conspiracy with his lover, who also happens to be Short’s killer…” — but (spoiled ending alert, if anyone cares) it’s his lover’s mother who is Short’s killer, isn’t it? Either way, you’re right that the movie’s mucks this up, almost like DePalma and screenwriter Friedman needed to prove at the last minute, after failing to have done so throughout, that Josh Hartnett’s character really was complex. He subscribes to his own moral code!!! a. sorkin is back in da house! teamosil what?